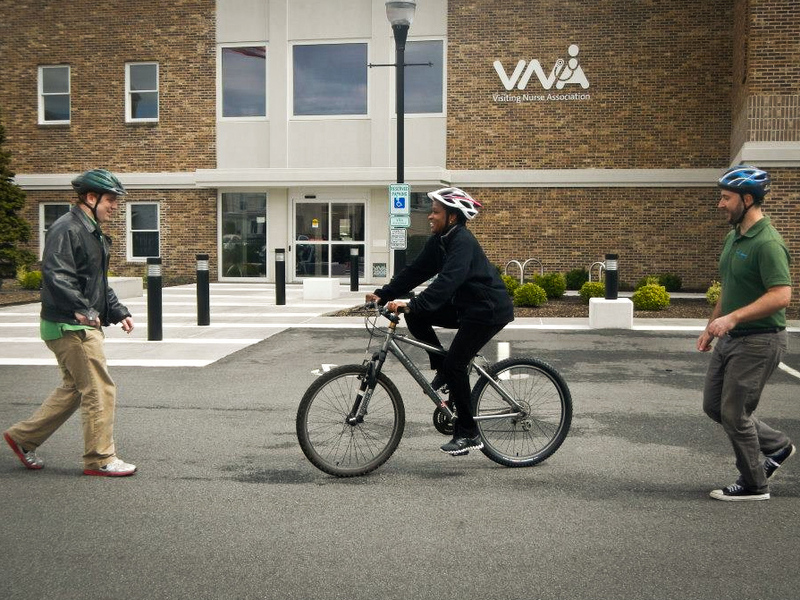 Bike and Walk Morristown recently teamed up with TransOptions, and held Morristown’s first ever adult learn to ride class, and we are really excited about holding our second session on Saturday, May 4, 10 am-noon. In a short two hours, three adults learned to balance, pedal, stop and steer their bikes and it was really exciting when at the end of the class, everyone rode their bikes to success across the parking lot and then continued to ride their victory laps around the parking lot, just because they finally could! For this class, students need a helmet (which made one person really late when they stopped to buy one), and a bike, and after that they needed to show up, and also push their nervousness aside and give it a go. Bill Feeney and Andrew from TransOptions started the class by removing the pedals from all the bikes and people spent the first hour scooting along, just getting the balance part right. One by one, they put their pedals back on, were given some instructions on how to push off, and with Bill holding the seat, they pushed off on their first ever bike ride. I think this was really the best event Bike and Walk Morristown has ever been involved in, and we have had some pretty amazingly fun events! I felt so great afterwards, it was almost like I had learned to ride a bike! To see the students when they showed up, and were nervous, but determined push through and fulfill what some said was a lifelong dream was really touching and inspiring. One student, brought her three kids who cheered her on and now she can ride along with them. Another picked up a bike the day before to learn to ride on because she liked the color (my first adult bike was also picked on color, a sparkly purple, so I can appreciate her deicsion). While watching the class, I also got to eavesdrop while a student’s wife called their son at college to tell him that his dad was learning to ride a bike. All three said there were coming back to our May 4 class to learn to ride again, but I’m pretty sure that they as soon as they got home, they headed back out to a trail and are probably riding on right now. If you or someone you know wishes you had always learned to ride, this free Adult Learn to Ride class still has room! Register online here at TransOptions; pick ‘Adult’ as type of class and “Adult Learn to Ride Class’ will appear as option in drop down menu). It isn’t very often that you get a a chance to change a regret into happiness in a short two hours! Bike and Walk Morristown started up our Bicycle Education program last spring, and sponsored a local resident Tina Wahlstrom, to become a cycling instructor. We have another resident set to take the intensive League of American Bicyclists cycling instructor course, and hope to build our program into one of the best in New Jersey. We are also really lucky in Morris County to have TransOptions and their bike instructors that are dedicated to making people safe and confident, as well as teaching them to ride. We have a Traffic Skills 101 on April 27, which has one more spot in it, for people who know how to pedal already, but if you don’t know how to pedal, May 4 is your chance! Also many thanks to Visiting Nurse Association for letting us use the smoothest parking lot in town. If you are interested in a class for yourself or your group, let us know! Would love to set up more traffic skills classes, as well as learn to ride for kids an adults.